SUPPORT THE LITERARY WORLD AND ITS WRITERS BY DONATING TO THE PEDESTAL MAGAZINE! 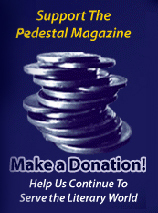 Help insure The Pedestal Magazine.com's continued online presence with your tax-deductible contribution! The Pedestal Magazine.com has received a letter of determination from the Internal Revenue Service stating that it qualifies as a not-for-profit charitable corporation under section 501 (c) (3) of the Internal Revenue Code. A copy of this letter is available upon request. We very much need your support in order to accomplish our mission of continuing to cultivate and promote the world of literature in its various manifestations, publishing and presenting literature and performance art from both new and established artists, thus bridging the gap between the print and online worlds, the traditional and the contemporary. By donating to The Pedestal Magazine, you will be directly supporting writers and performance artists, in addition to ensuring that The Pedestal Magazine, as a multifaceted publication and venue, continues to thrive and expand. Please feel free to email us at pedmagazine@carolina.rr.com if you have any further questions. If you wish your contribution to remain anonymous, or if you would like to make a donation in the name of a person other than yourself, please note this in the field titled "Name on contributors page." All contributors who contribute $25 or more will receive a complimentary copy of a staff member's book or CD. Make a contribution of any amount you choose. You can also use this button if you'd like to make a donation higher than $99, but not necessarily $100, $250, or $500; for example, you can use this button to make a donation of $153 or $317! *We are required to inform you that the amount of the contribution that is deductible for federal income tax purposes is limited to the excess of any money (and the value of any property other than money) contributed by the donor over the value of goods or services provided by the charity. Thank you again for supporting The Pedestal Magazine!